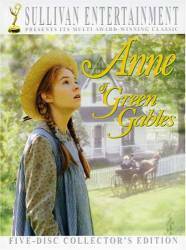 Other mistake: When Matthew and Anne first arrive at Green Gables, the person playing Matthew is not Richard Farnsworth, but a stunt double whose hair is quite obviously shorter than Mr. Farnsworth's. The stand-in's face is clearly seen as he walks around the carriage (Anne is in the foreground, close up). The stand-in is still taking Mr. Farnsworth's place as he walks Anne to the front door. The shorter hair is obvious in this view of his back.